Mill-Max is expanding its line of wire termination interconnects with new socket and header strips rated at 4.5 amps per contact. These connectors feature pins and receptacles with soldercups that can accept up to 20 AWG stranded & 18 AWG solid wires. They are a convenient and reliable method to make connections between discrete wires or cables and mating components such as PC boards or other cable assemblies. These soldercup connectors are ideal for wire termination applications where direct wire connections are required. They eliminate the difficulties of soldering wires directly to boards and the headers and sockets form mating pairs for easy configuration of interconnects. Uniform orientation of the soldercups makes it easy to solder your cable or discrete wires to the pins by eliminating the need to manipulate the wires or the connector to solder each wire. Once the wires are securely soldered in the cups you have a wired assembly; a perfect interface solution for discreet wire-to-board, cable-to-board or cable-to-cable applications. The brass pins and receptacle shells are high speed machined to precision tolerances. Each receptacle is fitted with the Mill-Max #47 stamped beryllium copper contact which accepts .025" - .037" (.63mm - .94mm) diameter leads as well as .025" (.63mm) square leads. The male headers feature sturdy .030" (.76mm) diameter pluggable pin tails for mating with the corresponding solder cup socket. Standard plating options are tin or gold. 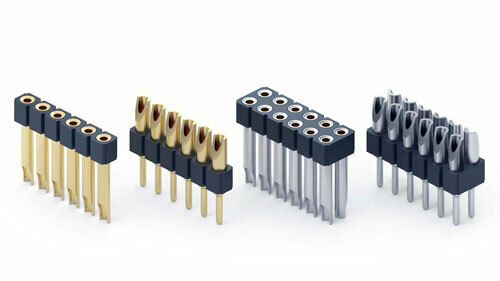 All connectors in these series are on .100" (2.54mm) spacing and feature high temperature PCT insulators, suitable for RoHS-2 soldering profiles. They are available from 2-64 positions single row and 4-64 positions double row.